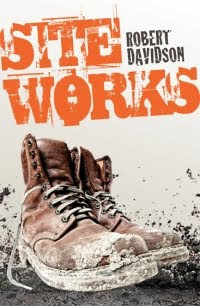 On Thursday 28 April at 6.30 I'll be talking with Robert Davidson, editor of Sandstone Press at a book launch event at Blackwell's in Edinburgh for his new novel, Site Works. Bob has drawn on his own experience as a civil engineer in the water industry to write this intense look into the lives of men whose hard work makes our lives liveable, yet who we usually see as indistinguishable figures knee-deep in mud. On a wind lashed coast in the far north a group of men assemble on a construction site. The Ness and Struie Drainage Project will dominate their lives for the next few months as they toil through the daylight hours and into the night, endure hardship and conflict and – mostly - survive. Within the compound and fencelines a new, temporary world will form, bounded by sea, mountains and sky. Site Works is the story of the men and their work, transients creating something permanent and greater than they know. I'm reading this book right now and thoroughly enjoying it. Reading books like this is often what sets someone on the road to being a socialist. You get a view of the hard-working and skilled men, as well as the vast machinery and body of technique that, as you said, keeps modern society going behind the scene. There's a realization of the constant effort that stands between organized society and the vast, often destructive forces of the natural world. I've heard, anecdotally, that Rudyard Kipling was popular reading in the Soviet Union, especially among boffins, technicians and engineers. It's seems ironic at first glance, seeing as Kipling was an avowed imperialist. Kipling did have a sense of the poetry and romance of these jobs, the ones the rest of us depend on. The poem "The Sons of Martha" is an example of what I'm thinking of. Interesting point about Kipling in the SU. The Italian communist Gramsci published a translation of Kipling's 'If ...' under the headline 'Breviary for the secular'. At the launch event I said that the book was 'like The Ragged-Trousered Philanthropists without the hope of socialism', and the author didn't disagree. There are two socialists in it but for them it's a private faith, not a project. In a conversation beforehand he said his working life could be divided into two parts: before and after the Health and Safety at Work Act. It made a huge difference on the sites. If Britain ever does go socialist the whole workers' control of production bit would be completely legal under the Act.